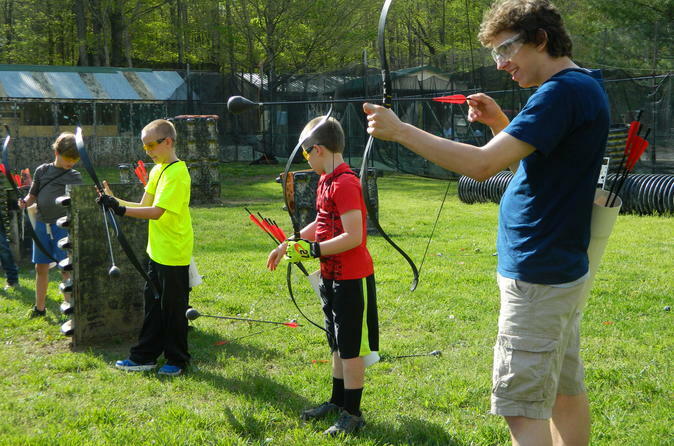 Arrow Tag® Archery Games are a blend of dodge ball, paintball, and laser tag, combining the best aspects of these sports while adding the skill of archery. Players use bows and special rubber-tipped arrows, and Arrow Tag® is a year-round activity that everyone can enjoy. Arrow Tag® Archery Games are a low impact option without the bruises of paintball. Arrow Tag® Archery Games are a blend of dodge ball, paintball, and laser tag, combining the best aspects of these sports while adding the skill of archery. Players use bows and special rubber-tipped arrows, and Arrow Tag® is a year-round activity that everyone can enjoy. Arrow Tag® Archery Games are a low impact option without the bruises of paintball. Participants will learn survival skills along with how to string and shoot a bow. This exciting, action-packed sport offers the ultimate low impact, family-friendly team building experience. It’s basically dodge-ball; archery and laser tag on steroids. It’s also a good cardio workout. You’re doing squats, lunges, and you’re running around for almost the entire game. You can burn up to 300 to 400 calories in a 1 hour session, getting everyone off the couch and away from their screens, one of our business goals. The objective of Arrow Tag® is to obtain points by shooting your arrows across the playing field at your opponents. The team with the most hits wins. Family reunions, birthday parties, church groups, clubs, amateur archers and corporations can book 1 to 2 hour-long sessions for up to 20 people or up to 40 people rotating during breaks. Arrow Tag® Archery Games are games of mock survival. You will indulge in the art of hunting with a bow and arrow as you duck and hide not only to keep from getting hit by an arrow but to tag your opponents. Arrow Tag® Archery Games are a high energy, fast paced adventure where the hunter is also the hunted. We offer free parking, restroom and shower facilities and other activities to make it a fun adventure day for you and your friends.